Thomas Rottinghaus became fascinated with the written word and the power of imagination at a very young age, reading virtually everything he could get his hands on by authors as diverse as Jules Verne, Louis La’Mour, JRR Tolkien, and Stephen King. He went on to study literature and writing at Colorado Mesa University, formerly known as Mesa State College, before pursuing a career in agribusiness. His writing blends genres into an entertaining amalgam of fantasy, westerns, science fiction, and adventure. He resides in a small town in Colorado with his wife, Lisa, a very energetic blue heeler named Jake, and a herd of cats. Congratulations on the release of your latest book, Graywullf: Book One of the Dragonspawn Trilogy When did you start writing and what got you into western/fantasy? I started writing over 30 years ago in high school, but didn’t entertain thoughts of publishing until recently. I became interested in the genre of western/fantasy, to be honest, after reading Stephen King’s Dark Tower series. 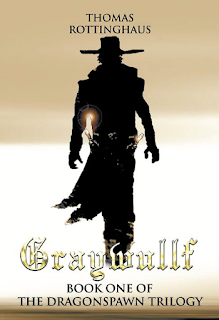 Graywullf follows the exploits of a band of gunslinging lawmen known as magii’ri Warriors in a country called Norland. The Warriors are led by Lorn Graywullf, a descendant of one of the very first magii’ri, but they are ruled by the Wizards of the Light, who have become corrupted by greed and infiltrated by Wizards of the Dark. The Warriors remain true to the Light, and the ensuing conflict between the Wizards and Warriors escalates into a full blown Revolution. The Warriors are aided by a Dark Wizard of tremendous power named Lynch, whose true loyalty lies only to himself. As the action unfolds and the casualties mount, it becomes clear that the only way for the Warriors to prevail will be to ally themselves with loyal Wizards of the Light and create the Dragonspawn, a Warrior of unbelievable power. However, the creation of the Dragonspawn is extremely dangerous, because he embodies all the prowess of an ultimate Warrior and the strengths and unique powers of a Dragon, along with the unpredictable nature of the beast. Seriously, I hope that my readers will be engrossed and entertained. There is no special message in Graywullf, but I suppose the underlying theme is to be true to yourself. No. Gun enthusiasts will recognize that I took some liberties with the capabilities of muzzleloading firearms for the sake of dramatic license. I have several avenues to take when my muse refuses to cooperate. Playing AC/DC at unusually high decibels sometimes works, as well as a good weight workout. Or I simply take a break, go on about my day, and let my muse have her day off as well. I think action is exciting, so I keep the transitional areas of my book short. Lots of movement and not too much dialogue, although dialogue is important. I have no writing schedule and I am extremely undisciplined. If I feel like writing early in the morning I write. If not, I simply go off to work like everyone else. Sometimes I write in a notebook wherever I happen to be, but usually I write on my desktop computer at home. Sometimes I go weeks or months without writing a word, then I write page after page. My publishing process was long, drawn out and frustrating for some time. I tried halfheartedly to find a traditional publisher, but I came to the conclusion that unless you know someone on the inside you will probably not become published traditionally. The actual process of becoming published independently went smoothly and I am totally satisfied with the physical product. The marketing and publicity, however, is very frustrating. Graywullf is available through many online outlets including Amazon, Barnes and Noble.com, and hundreds of others sites. It is available in print as well as an E-book. Cover art and author photo published with permission from the author and author’s publicist.